Saturn has its closest encounter with Earth for the next 29 years tonight. When So to start 2004, look up, and directly overhead you’ll see a bright yellow star, which is Saturn — its closest encounter with Earth for the next 29 years. Details here. Have a safe and fun New Year’s Eve, Day and ’04! 2003/12/30 Bay Area Extreme Weather; Top Weather Events Of 2003; No El Nino For ’04? Remember, school closings links are found on WXnation Web pages for your nearest major city. 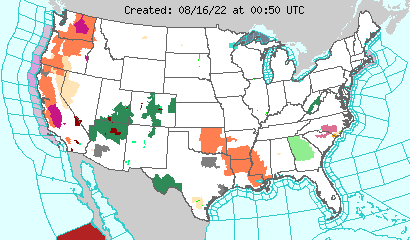 Simply look in the left column under weather radars, current conditions and warnings. Off-Season TD Brews; Back To The Moon?